I love the dress. You are just used to seeing yourself in bright colors so it doesn't look right to you. 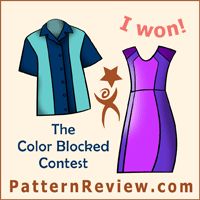 I like the dress, but the color and the wider stripes on the one you linked to certainly make a better statement! I also like the shoes you're wearing in the apple shot better. We have two "cooking pear" trees - I had never heard of them before we moved here, but you have to cook the pears in order to bring out the good flavor. Neither my husband nor I are pear fans, so every morning I pick up almost 100 pears (many partially eaten by birds and squirrels) and then I give some to the chickens and some to the horse, so they don't go entirely to waste. I LOVE the dress. It is one of my favorite things you have made and I think it is very flattering on you. 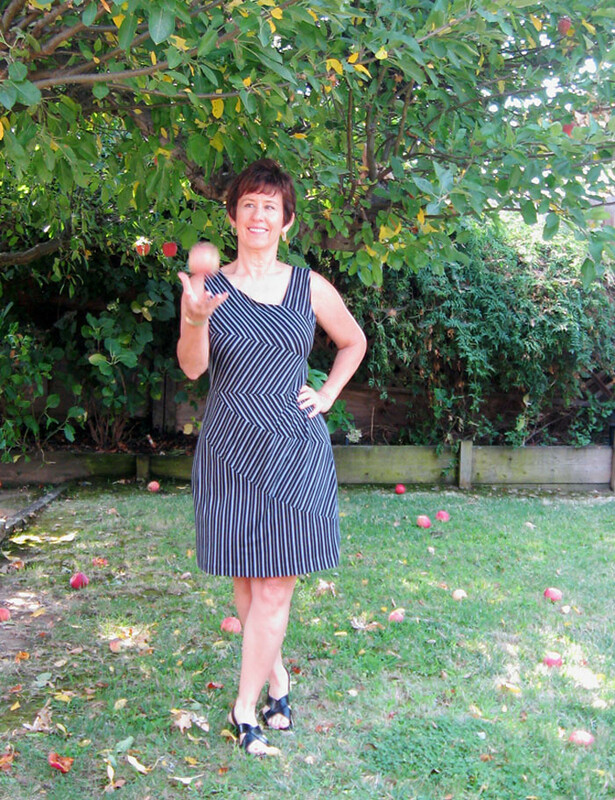 I also like the sandals in the apple shot best. I really like the front. Like you, I find the back a bit odd. 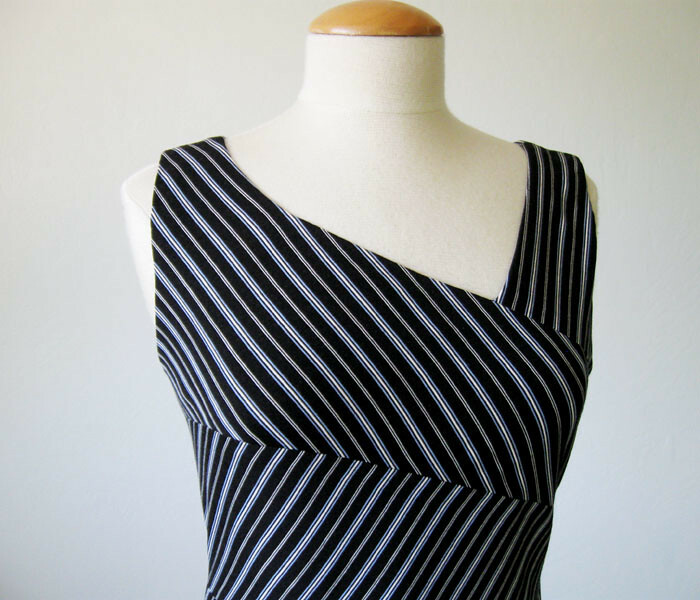 The diagonal back skirt seams could be rotated to vertical, to better work with stripes. 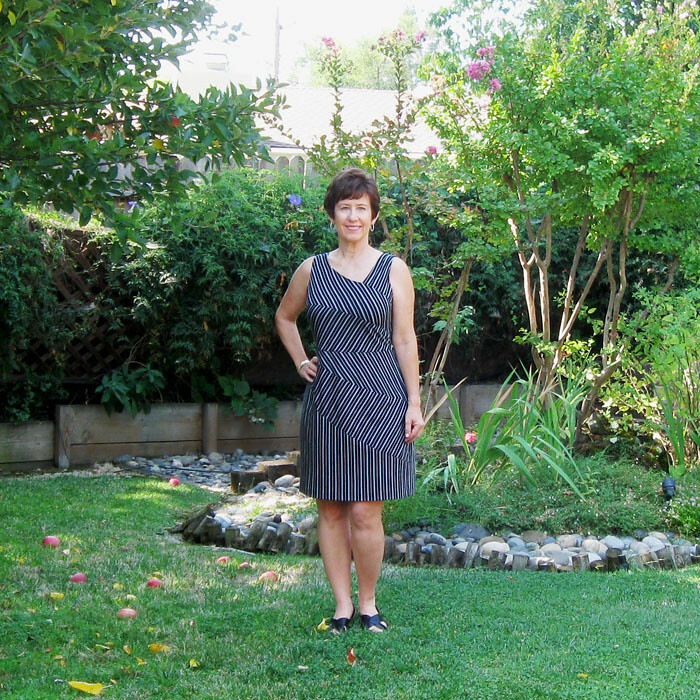 I like this dress, I like it on you-great work! too bad you don't like this. It's so well done. 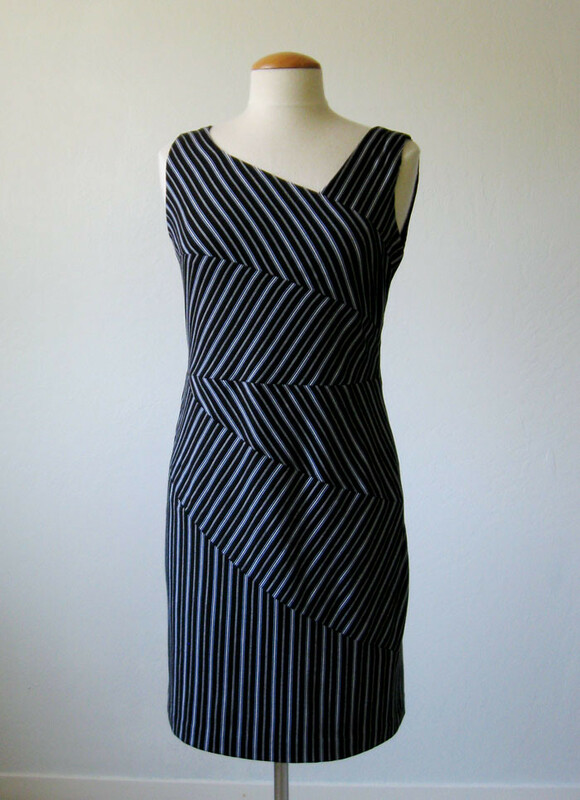 I like the front, and separately I really like the back lines- but maybe in a plain fabric. I couldn't wear those asymmetrical dresses either. 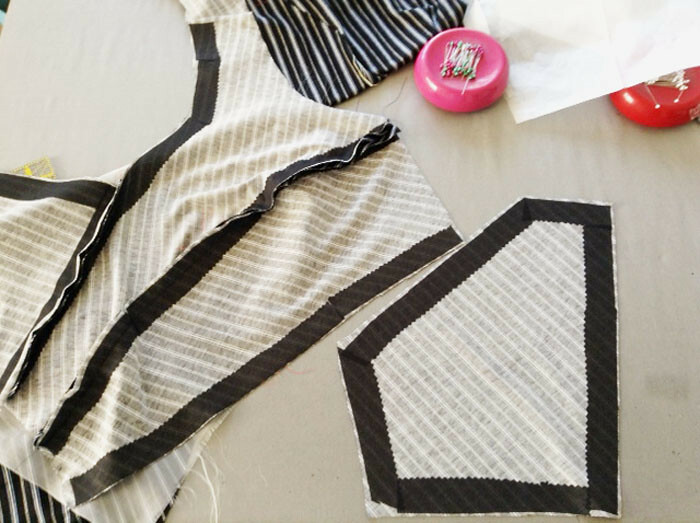 But the tip about interfacing all the seams- wow, do I know a lot of instances to use that! I'm always learning from you! oh yeah- cider or applesauce is your best bet. I really love that dress, it looks great on you. I don't wear black very well, so I can understand how the non-color bothers you. Could you add a bright necklace or a cardigan to brighten it up? I like the dress so much but understand about not liking certain colors in certain parts of the country. I just think the strength of the sun lets you wear and enjoy brighter colors. 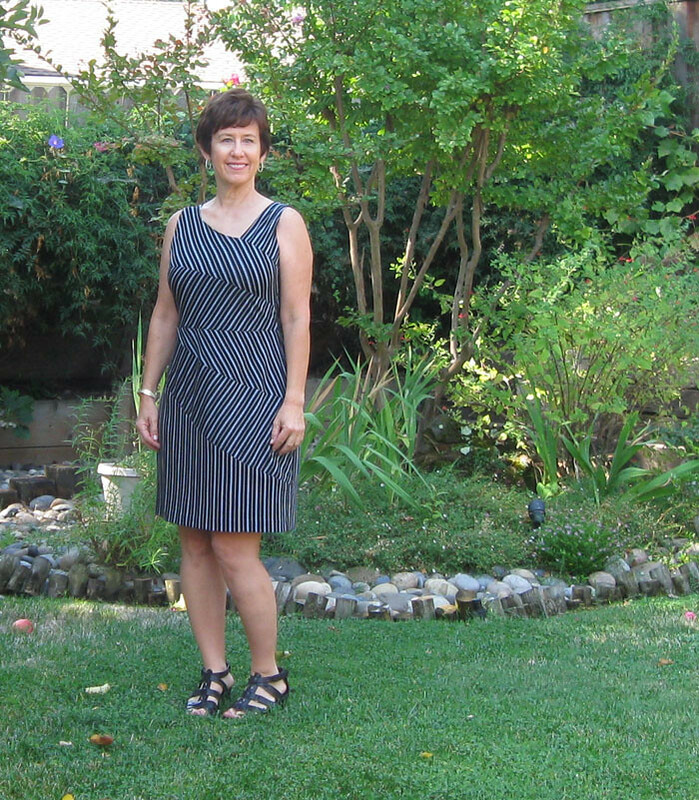 This dress would suit my Baltimore life but when we lived in southern Florida I would have felt drab. It's a beautiful make and very complimentary. You might try a solid pop of color, like a red or pink, which would both work with blue, such as in shoes and a cardigan or belt. The sandals are echoing the stripes, so maybe a solid pump. But really, it's a stunning dress, just more formal maybe than you're used to. When I first saw this I thought, this is so not typical of you, mainly because of the color. But, it's my color palette, or lack of it, and I love it. The shape and fit are really wonderful on you. I love to add some bright accents with my accessories. You might like it better with red shoes(my favorite) or a scarf in a bright print would be lovely as the weather gets cooler. I am on the lookout for some great silk prints to make some scarves. I actually like to hand roll hems. Anyway, maybe it will grow on you. Wow! What a beautiful dress! You are so talented. I know you're actively shunning fall but this fits right in with a jacket/cardigan. It looks fantastic on you. Beautifully done in every respect. Once you add a pop of contrast with an accessory or a jacket, you'll be good to go. It's too well done not to wear b/c the silhouette looks great and so does the fabric layout. White? Hot Pink? It would be great to see another photo with that experiment. I love your version of the dress. 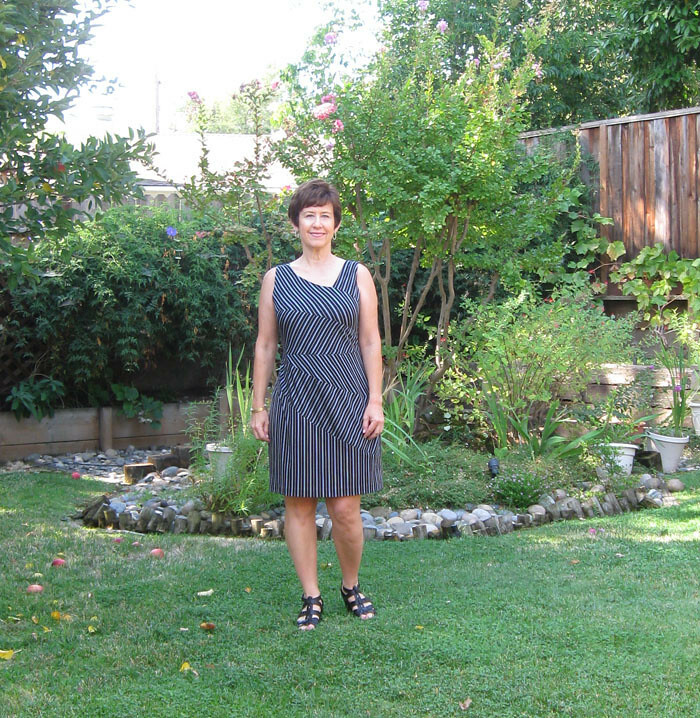 The others I have seen in sewing blog land, with their brighter wider stripes, make me want to ask, "Is the circus in town? Your dress is eminently more tasteful and wearable. 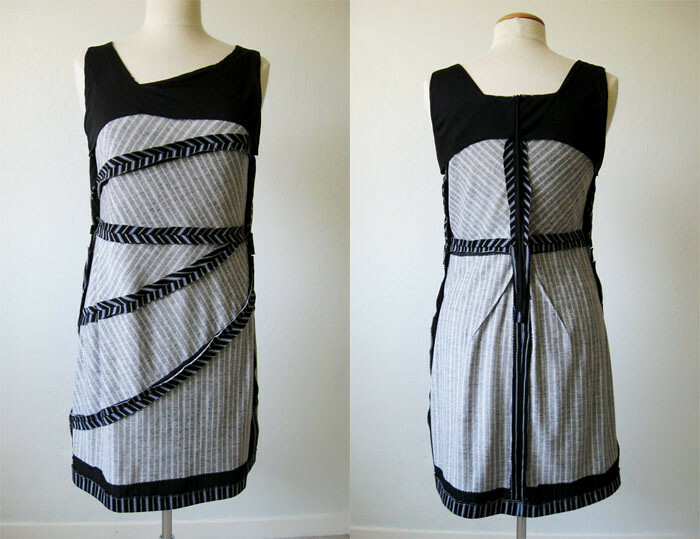 Interesting that in the link you provided, more matching is possible with the horizontally striped fabric. Hmm. 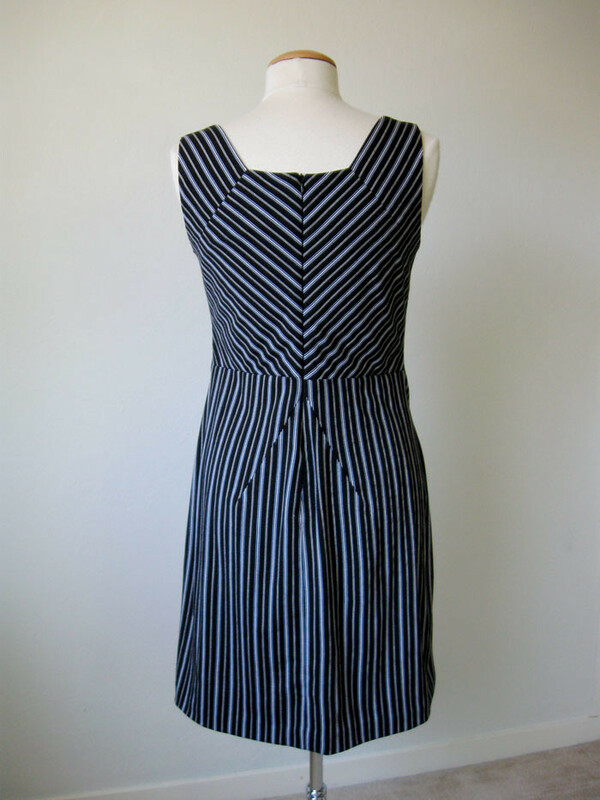 I like the pattern a lot; perhaps with a bright jacket on a cool day you'd enjoy these dark stripes. The apple photo sandals with the diagonal straps are much better. With the strappy sandals, I think the combination of the high contrast with your skin tone and the horizontal strap cutting your leg off at the ankle, is not as flattering. Lovely dress! I agree with the others that it looks great on you, and indeed a bit more formal, "for the office" than the versions ive seen with brighter or wider stripes. But i do hope you will wear it, since i think you look great in it. Then again, if i had your beautiful light blue eyes i would also want to wear that brighter shade of blue all the time instead of the darker shades of this dress. 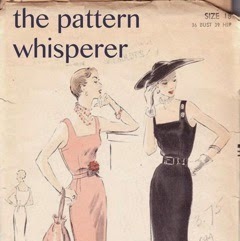 Anyway, I'm very glad you tried this pattern out because i have been thinking about it and with your advice i might finally take the plunge. SAY YES TO THIS DRESS!!! This dress is awesome! It just needs some color with a good necklace, bracelet, and colored shoes (since the black bothers you). I want to make one just like it!